Time for another round of Yvo’s Shorties! This time a double dose of third and final book of a series… Yes, I’ll be marking two more series as finished with this post! Sadly both of these weren’t as good as I hoped. 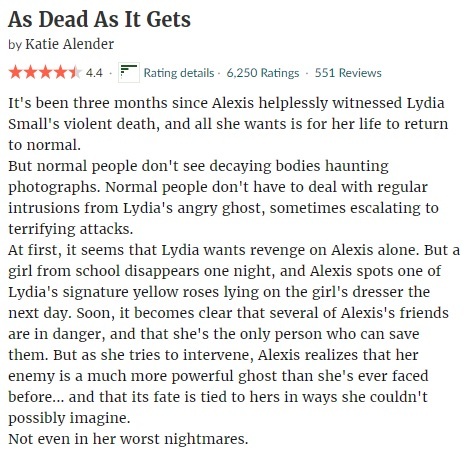 As Dead As It Gets by Katie Alender is a bit stronger than the sequel, but the main character is annoying and I still prefer book one. 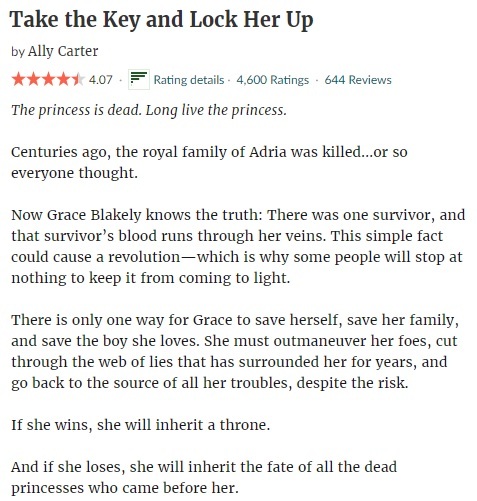 Take The Key And Lock Her Up by Ally Carter is by far the weakest book of the series and I don’t really care for the ending either… Things have been going downhill since book one. Oh well, at least it’s two series less to worry about right? WARNING: Possible spoilers! Don’t read my rambles if you haven’t read the first two books of this trilogy yet… You’ve been warned. As part of my promise to finally start finishing those poor neglected series, I decided to pick up the third and final book of the Bad Girls Don’t Die trilogy while my memories of the second book were still fresh. And while I still think the first book is the strongest, As Dead As It Gets without doubt makes a comeback from what I call a ‘weak-second-book-syndrome’. No more sunny and miss nice girl, because Alexis has another paranormal problem on her hand and things are quickly spiralling out of hand… And things might turn ugly. The writing is engaging and reads superfast as always, making As Dead As It Gets a fun, exciting and speedy paranormal read. The plot is darker than the second book and adds a level of suspension to the story… Without doubt an interesting final adventure, although I’m still on the fence whether I like the ending or not. Strong final words though! I do have to say I still find Alexis annoying with her whole ‘I need to do this alone’, ‘I clearly need help, but I won’t ask anybody even if they are willing’ and ‘I don’t want others hurt, but they somehow do anyway’ attitude. 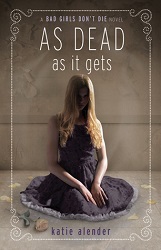 I could have done without the love triangle as well… But there is no doubt that As Dead As It Gets is still a solid and entertaining YA paranormal read. I was a big fan of the first book when I read it back in 2015. I liked the sequel as well, although the main character was realy started to bother me… But still I had added this third and final book to my list of most-anticipated 2016 releases. Why didn’t I pick up Take The Key And Lock Her Up sooner then? I have no idea, other than that it probably slipped between the cracks of my exploding TBR pile. I had forgotten about the details, including the supposedly enormous cliffhanger ending, by the time I was able to get to it… But it was quite easy to pick up the thread anyway. That said, it was by no means the reading experience I was hoping for. 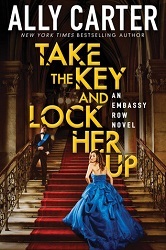 Unfortunately, Take The Key And Lock Her Up is by far the weakest book of the trilogy and it’s sad to see a series end on this note as it started out so promising. One of the biggest problems I had was with the main character Grace. I already had these feelings in the sequel, but Grace becomes almost unbearable in book three with her constant whining about just how crazy she is, how she is endangering others by just being close, that she should be punished, that she doesn’t deserve positive things happening to her etc… Yawn. Her whole attitude, dialogue and actions seriously annoyed me and it was one of the reasons the final book didn’t work for me. I wasn’t 100% convinced by the writing either, but this is probably mostly related to Grace and her dialogue. And the whole love triangle and romance put a damper on things as well. As for the plot… If you look critically, nothing much is actually happening during this final adventure, or at least I missed the intensity and suspense. It has some interesting pointers, but overall I was quite disappointed by Take The Key And Lock Her Up. This entry was posted in 2.5 Star Rating, 2018, 3.5 Star Rating, Book Reviews, Yvo's Shorties and tagged 2.5 star rating, 3.5 star rating, ally carter, as dead as it gets, bad girls don't die, book review, conspiracy, contemporary, embassy row, fantasy, fiction, foreign cultures, ghosts, international, katie alender, paranormal, published in 2012, romance, series, spy, take the key and lock her up, ya, Yvo's Shorties by Yvo. Bookmark the permalink. I agree that the second book in the Katie Alender series is a bit weak. The third does make up for it! It’s without doubt a lot stronger than the sequel!